Good Stuff NW: The "L" Word: Chilaquiles For Everyone! I buy corn tortillas in the big stacks at the grocery store, in the packages that proudly declare "5 Dozen." I get home, throw them in the freezer, and when we have tacos or tostadas or pork posole verde, I make sure to peel off a couple more than I think we'll need for dinner. That's because I have a secret agenda for these leftovers for the next morning, a breakfast treat for myself that takes maybe five minutes to make but makes me clap my hands in anticipation of its gloriousness. 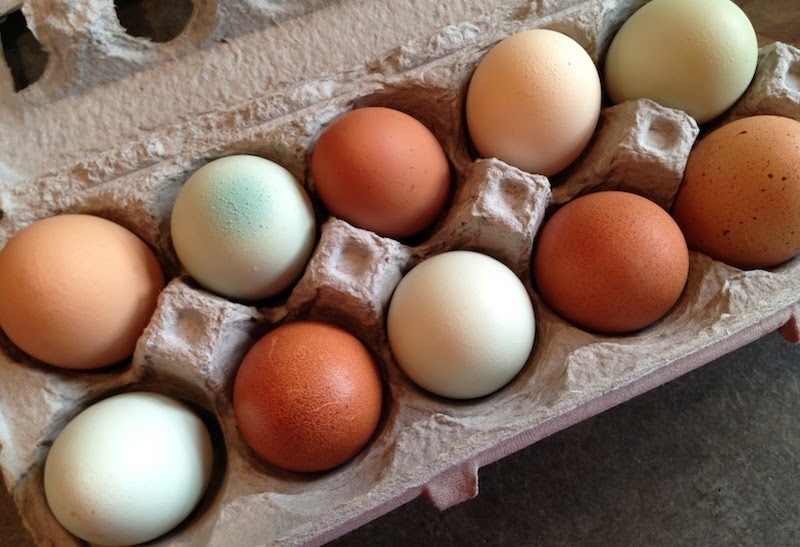 With eggs like these, who needs to dye them? I first had chilaquiles (pron. chee-lah-KEE-lays) on our very first trip to Puerto Vallarta, Mexico. Our beachside hotel had a breakfast bar and I wandered down the line, taking a little of this, a little of that and a lot of fresh fruit. One of the warming trays had a combination of scrambled eggs and tortillas, jalapeños and tomatoes that was so good I was pushing aside the papayas to pile more on my plate. Since then we've had them for brunch and dinner, just for us and for a crowd, with bell peppers and tomatoes chopped in or simply plain (top photo) with salsa on the side, and they never fail to satisfy. So next time you've got tortillas left over, make sure to save a couple for your own secret breakfast treat. This is for one secret breakfast, but it's easy to up-size for a crowd. And feel free to sauté a mix of peppers, garlic, onions, tomatoes or whatever strikes your fancy after you've fried the tortillas, then add the eggs and scramble. Heat pan over medium heat and add butter. When foam subsides, lower heat and add tortilla strips, frying briefly on each side to brown. Remove from heat, add eggs, cheese and salt and combine. Return to heat and scramble until the eggs are done (I like mine very soft). Serve with salsa on top or mixed in…it's your secret breakfast, so make it your way! That sounds delicious. And your eggs are beautiful! 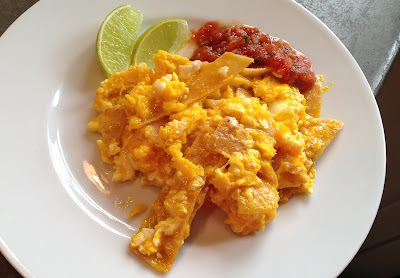 This sounds a lot more like Migas than Chilaquiles....also delicious!